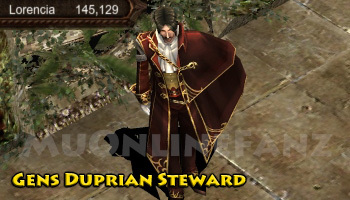 Gens Duprian Steward <+> [MU Online Fanz] <+> Official 3rd-party [MU Online] Fan Site & Game Guide! Gregory is the Gen Duprian Steward. 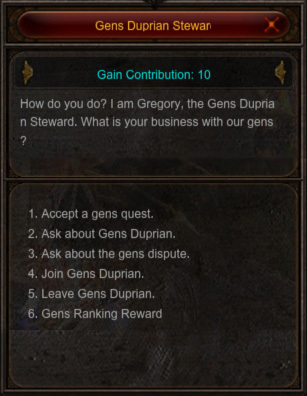 Speak with him to learn more about Gens Duprian. This NPC can be found in the safe-zones of Lorencia (145, 127). Option (6): Receive any Gens rewards you've earned. Check the Gens Guide for more info about the Gens system. "Gens Duprian is a guild of the greatest heroes in Arca, and at it's heart is the Duprian clan: the mightiest noble bloodline in MU. We are led by Duprian Winston, a knight who knows no equal in the whole of the MU empire. Gens dispute? Gens Vanert's rebellion is more like it. The gens dispute started because of the greed of Vanert Reicht, the commanding knight of Gens Vanert. Exactly five years ago, a band of heroes who were searching in Raklion far a stone with the power to seal away Kundun were slaughtered. At the time, we believed it was the work of Selupan, a giant spider and the ruler of Raklion, but soon learned that it was actually Gens Vanert. It is the duty of our proud Gens Duprian champions to retaliate and fight."